The fight of the century is on! In one corner, Justice Society of America member Wildcat, the greatest bare-knuckle scrapper on the planet. In the other corner, the Dark Knight himself, Batman! Who will win when two of the greatest fighters go toe to toe? 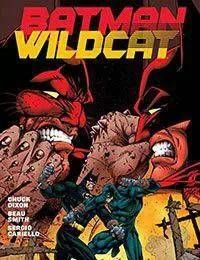 Itll take more than muscle if these two heroes want to try and shut down a secret superhuman fighting ring thats killing their combatants...and that's if they don't kill each other first!Written by critically acclaimed author Chuck Dixon, this graphic novel pits Wildcat against two Gotham City greats--Batman and Catwoman! Collects the full BATMAN/WILDCAT and CATWOMAN/WILDCAT miniseries as well as five additional classic Wildcat team-ups from THE BRAVE AND THE BOLD.